This article shows how taking a constitutional economics perspective can clarify the idea of responsibility. Applying constitutional economics, the authors distinguish between within-game (or sub-constitutional) responsibility when playing a game and context-of-game (or constitutional) responsibility for developing the conditions under which a game will be played. These two conditions are interpreted as comprising not only the institutions (rules of the game) but also discourse about the game, its deficiencies, and reform options. Accordingly, the authors’ concept of “ordo-responsibility” distinguishes between “governance responsibility” and “discourse responsibility.” This concept is used to critically discuss the conventional dichotomy between state and non-state actors. The authors examine the capacity of private actors to engage in political processes of rule-setting and rule-finding. The article thus provides important conceptual clarification for the debate on corporate social responsibility. The authors thank two anonymous reviewers as well as the editor for constructive and very valuable comments. 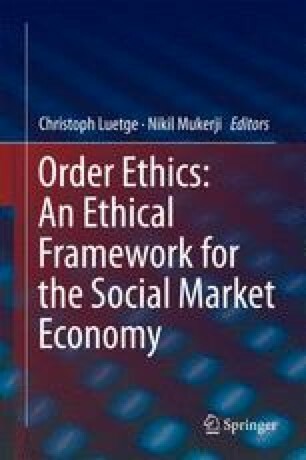 The authors also thank participants of the 2006 conference “Business Ethics, Social Integration and Corporate Citizenship” in Valencia, Spain, for comments on a conference paper that first developed some of the ideas of this article and that has been published as Beckmann and Pies (2008) in the according conference volume. Beckmann, M., S. Hielscher, and I. Pies. 2014. Commitment strategies for sustainability: How business firms can transform trade-offs into win-win outcomes. Business Strategy and the Environment 23:18–37. doi: 10.1002/bse.1758. Williamson, O.E. 2009. Transaction cost economics: The natural progression. http://nobelprize.org/nobel_prizes/economics/laureates/2009/williamson_lecture.pdf. Accessed 10 April 2013.